VUILLEMIN - Carte Générale Des Etats - Unis Et Du Mexique Comprenant L'Amerique Centrale Et Les Antilles. VUILLEMIN, A. / ANDRIVEAU-GOUJON, E. - Carte Générale Des Etats - Unis Et Du Mexique Comprenant L'Amerique Centrale Et Les Antilles. Carte Générale Des Etats - Unis Et Du Mexique Comprenant L'Amerique Centrale Et Les Antilles. - VUILLEMIN, A. / ANDRIVEAU-GOUJON, E.
Title : Carte Générale Des Etats - Unis Et Du Mexique Comprenant L'Amerique Centrale Et Les Antilles..
Map maker : VUILLEMIN, A. / ANDRIVEAU-GOUJON, E.. Size : 24.4 x 36.2 inches. / 62.0 x 92.0 cm. 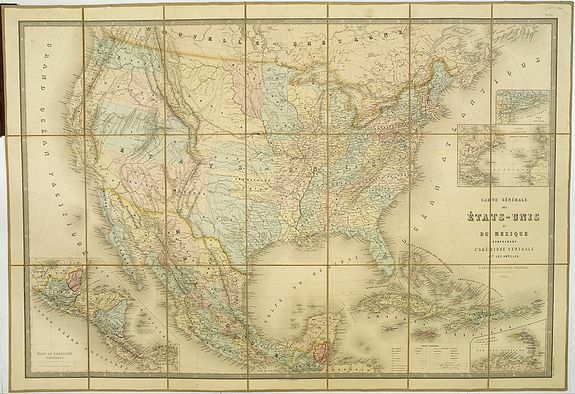 Description :Large folding-map of the United States, Mexico and West Indies, with inset maps of Central America, Lesser Antilles, New York and Long Island, and the Atlantic connections to Europe. Showing the Civil War-era from coast to coast and provides a very up-to-date account of the political boundaries of the West, especially notable for a European map produced during a period when the boundaries changed frequently as a result of the war. The advancing and existing railway lines to the West are of great interest. One of the most interesting of these changes is the early appearance of "Colona," the first name for Colorado. Colorado Territory was organized in the wake of the 1859 Colorado Gold Rush, which had brought the first large influx of white settlement into the region. Congress passed the organic act for the territory in the spring of 1861 during the thick of the secessions by Southern states that precipitated the Civil War. The organization of Colorado Territory was promoted to solidify Union control over a mineral-rich area of the Rocky Mountains. Another manifestation of the Civil War boundary struggle is the positioning of a horizontal Arizona in the southern third of a large, horizontal New Mexico Territory. The configuration represents John Baylor?s short-lived Confederate Territory of Arizona, which existed for nearly a year from August 1861 to July 1862. Union forces arriving in the winter of 1862 from California drove the Confederate troops back to the Rio Grande, foiling the Confederate ploy to gain control of the territory's rich mining resources. Congress created the official Territory of Arizona in February of the next year. Other western provisional boundaries presented on the map include "Dagotah" Territory lying in the region between Minnesota and the Missouri River, Nebraska covering the rest of the region up to the Rocky Mountains, the huge Utah Territory encompassing present-day Nevada, and a Washington Territory that stretches to the Continental Divide. Oregon has gained statehood, but has lost its eastern lands, which are destined to become the southern portion of Idaho and are here named ?Shoshone? in an unusual configuration below Washington. The map also details wagon and emigrant roads, topography, Indian settlements, advancing and existing railroads, and all of Mexico, Guatemala, the Caribbean, and Central America. European possessions in the Caribbean are indicated by underlining the names in colors representing France, England, Holland, Denmark, or Spain. This is a fascinating Civil War-period map by a notable French mapmaker in remarkable condition. Map is dissected into 21 sections and mounted on tan linen with the book plate of Andriveau-Goujon. Covers are dark green cloth 23.5x14.5 with Etats-Unis Et Mexique. Andriveau-Goujon. Rue Du Bac, 2I. stamped in gold on the front with embossed gold and green globe. The spine is stamped with Etats-Unis in gold. Map has full wash color by state. Condition : Folding case map on linen in 21 segments.